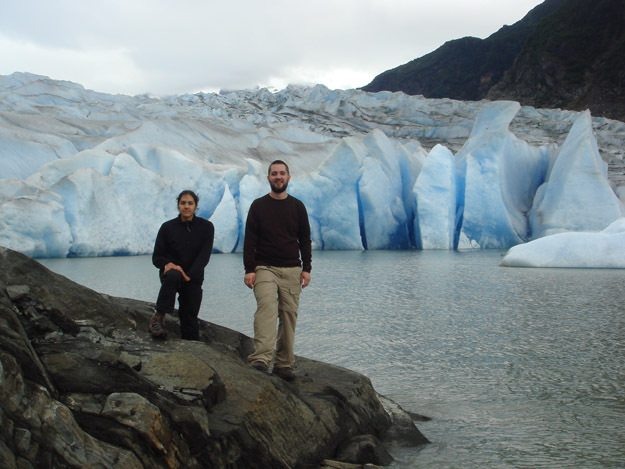 Colin and Kelly standing in front of Mendenhall Glacier. Last year, the ice was where they are standing. After arriving in Juneau, we went on a quick tour of the town before grabbing a bite to eat and setting up camp across the lake from Mendenhall Glacier. 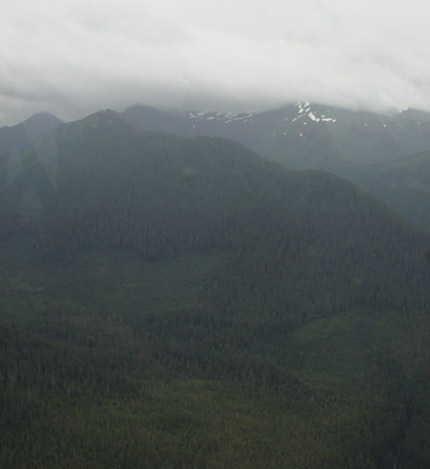 A constant misting rain provided a fitting welcome to Alaska. The next day we hiked up to the glacier itself while waiting for Dan Lawson and his crew to finish the necessary errands before our chartered flight to Gustavus. A view of foggy mountains from the Cessna on the flight to Gustavus. Once in Gustavus we met the final member of our party, Sarah Laxton, who had arrived at the house before us. The next morning the entire crew loaded into the Capelin, a small research ship, and Justin (our captain) drove us over to our first site, Beartrack, where Dr. Wiles, Kelly and Colin were dropped off for the next two nights. 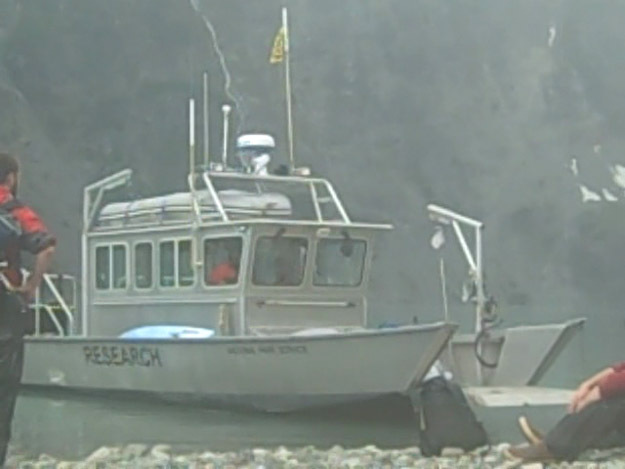 The Capelin, our trusted research vessel. 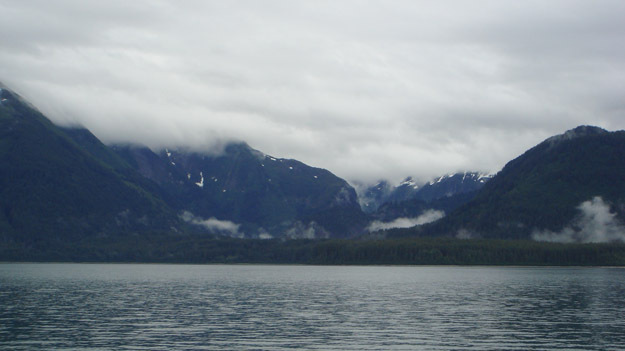 The Fairweather Range, as viewed from the Capelin. 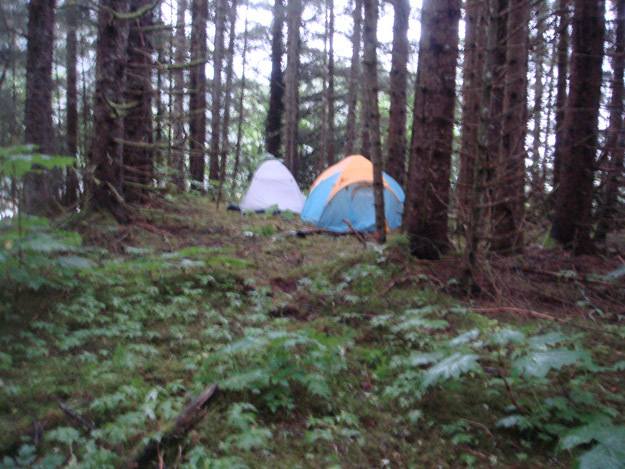 We set up camp in a small wooded area across from Beartrack Mountain and set off on a medium length hike marred only by an arduous return trek through a bunch of windfall. Our small camp in the woods. 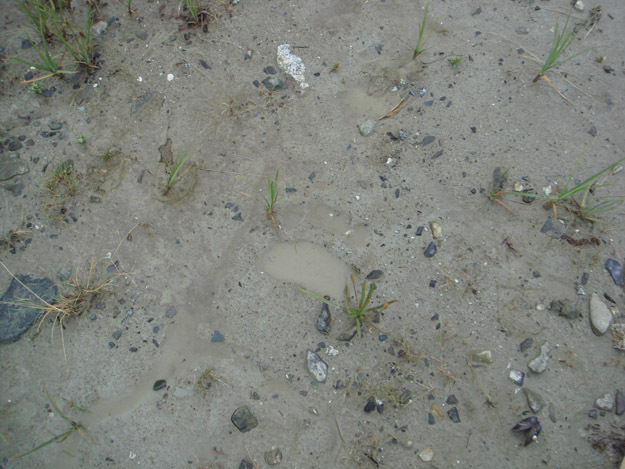 The area was almost an island during high tides, connected only by a tombolo to the mainland and, during low tide, another island via tombolo. In the mud just outside of our campsite, Beartrack lives up to its name. The next morning we embarked on an arduous vertical hike up Beartrack Mountain, made even more difficult by a section that had been ravaged by an avalanche, making the climb that much more difficult. 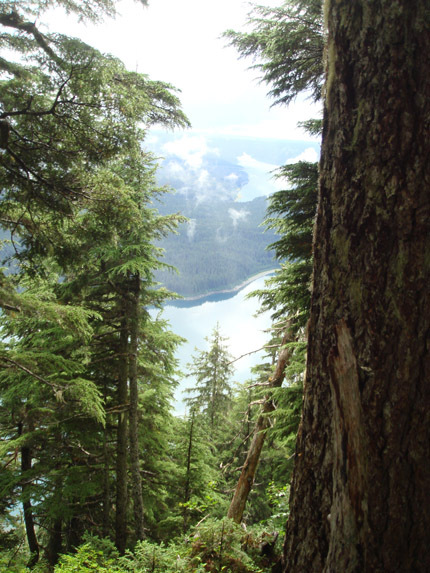 Large Sitka spruce dominated the lower slopes. As we rose in elevation, some mountain hemlocks were mixed in until finally towards the top only mountain hemlock remained. Kelly and Sarah core a mountain hemlock near our lunch site during one of the fleeting moments of sunlight. 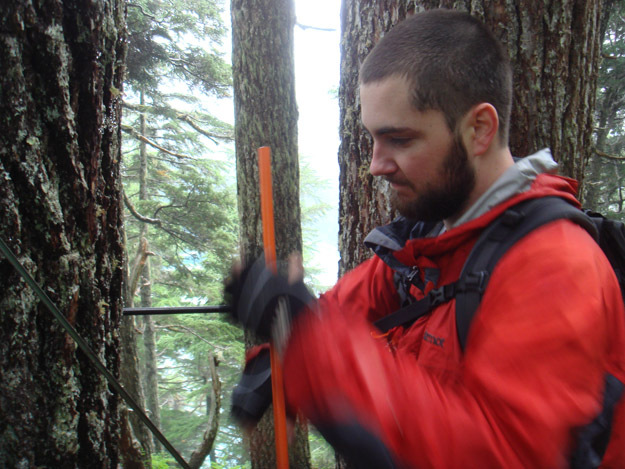 Colin uses the increment borer to core another mountain hemlock. One added benefit of our ever increasing elevation was one of many quite beautiful views of the fjord. 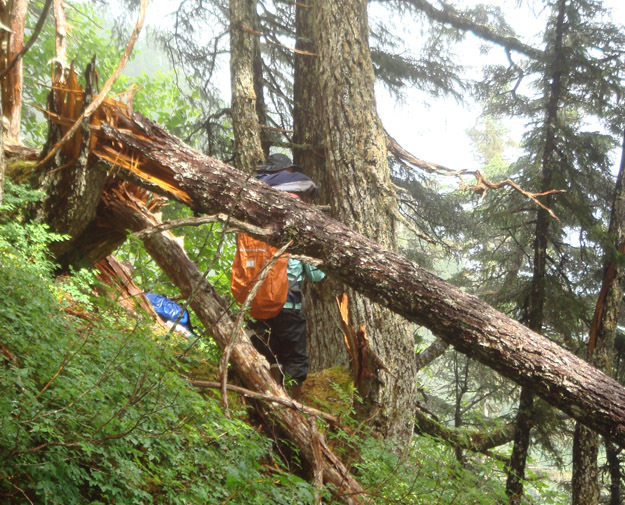 Once at our top site (next to a radio repeater station) we all split up and went off to different ridges to core some more hemlocks closer to treeline. Dr. Wiles head off with his trusty increment borer towards one of the ridges to core some yellow cedar. The next day we were picked up by the Capelin by Justin, Dan, Sarah and the rest and went by boat to upper Muir Inlet to collect samples of wood killed by glacial advances for Kelly’s I.S. These samples ranged from 8000-2000 years before present. 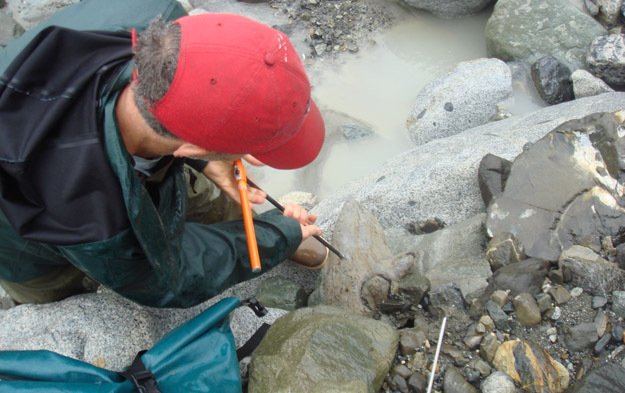 To find these samples we hiked up to Dan’s study sites which were located in fluvial valleys where debris flows and erosion due to rain had uncovered old pieces of wood. Along the way, we saw lots of evidence of glacial presence, ranging from moraines to huge glacial erratics. 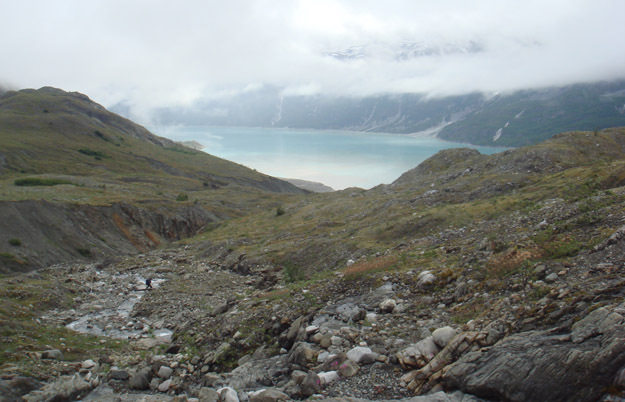 It was hard to fathom that the entire hike had been covered by glaciers a mere 30 years ago. 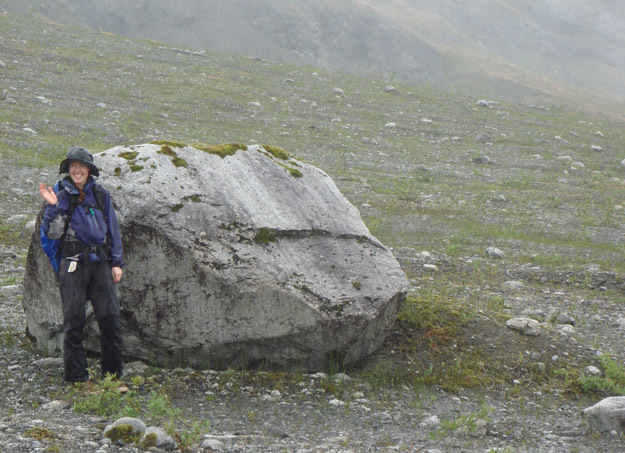 Sarah standing in front of a huge glacial erratic (one that didn’t have that far to travel). 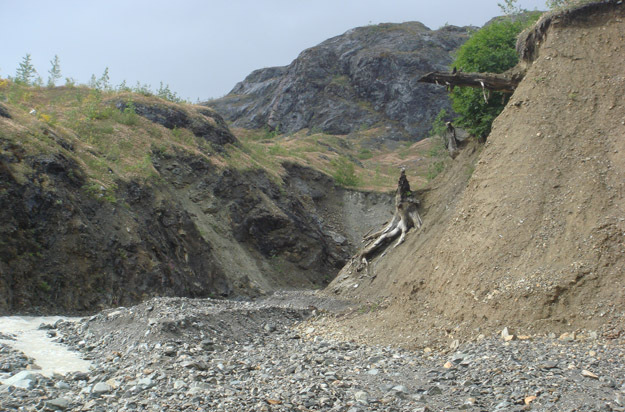 Notice the sediment in front of it that had been pushed along during the glacier’s advance. The crew advances on at a time down the steep slope into the valley. 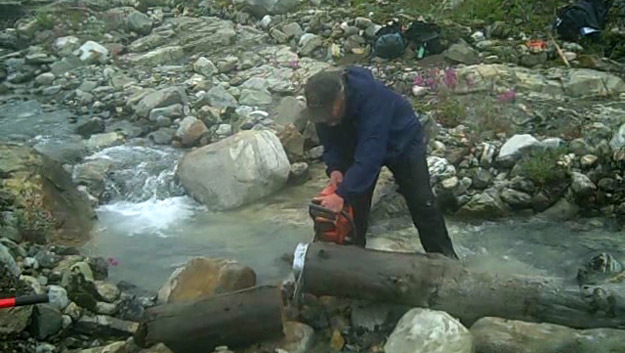 Dr. Wiles cores a trunk along the base of the streambed. 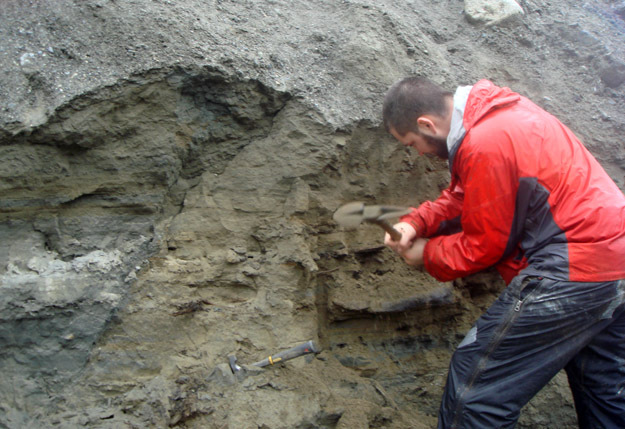 Colin digs out a piece of wood from the wall of the valley. The next day was similar. 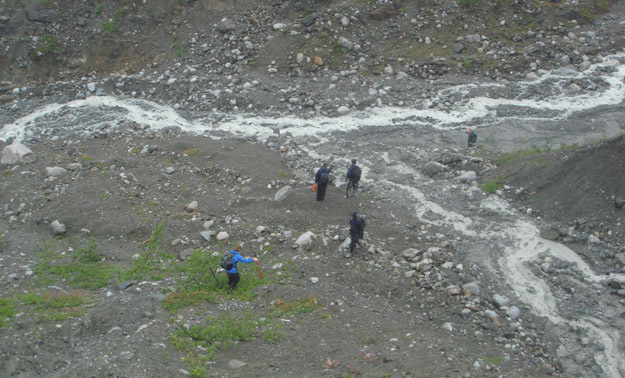 We hiked up to another stream valley to collect more samples. Dan cuts a cross-section with his chainsaw. On our way back down to the shore from the stream valley, the fog began to roll back and a wonderful View of Muir Inlet was revealed. 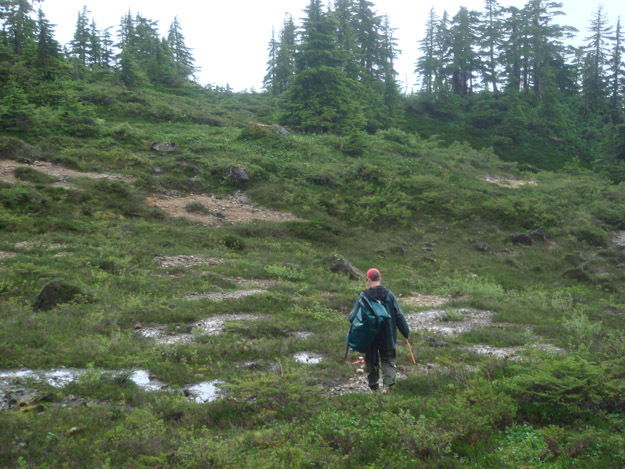 After we relocated to another valley nearer the base of the inlet, we located some wood that we think is 8000 years old. After four long days in the field, we finally returned to the house for much needed showers and access to a clothes dryer. Today was spent recuperating and going over what had already been done and what still remains to do. Sadly, we also had a casualty in our ranks. Sarah flew back home to British Columbia this evening with what is probably a fractured arm.